Scribe Publications are one of the few Australian publishers who commission translations, and I’ve already covered several of their books by authors such as Hwang Sok-yong, Tommy Wieringa and Gerbrand Bakker. However, recently they added another string to their translation bow with a few works in their new Scribble children’s imprint being brought into English. My name is Hayley Malone, and I’m seven years old. I like reading, playing with my sister and dancing. 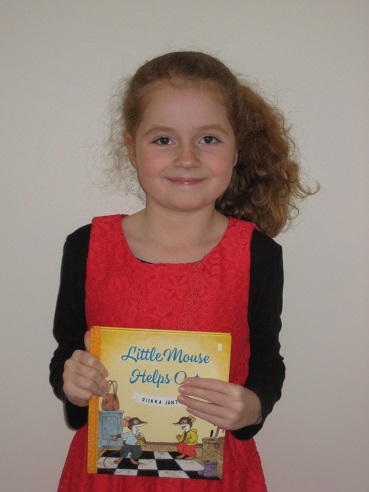 The book is called Little Mouse Helps Out, and it’s written and illustrated by Riikka Jäntti (the translation is by Lola Rogers). It’s about a mouse called Little Mouse. 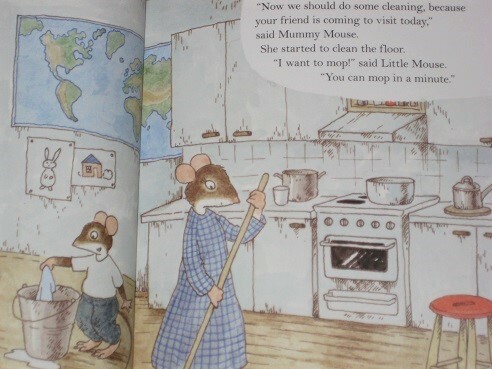 In the book, he helps Mummy to clean the house because his friend is coming, and they don’t want to get it all messy. And then his friend Pip rungs the doorbell, and they go to make a fort. After they made the fort, Pip had Little Mouse’s bear, so Little Mouse was angry, but Mummy made it OK. The doorbell rang – it was Pip’s Mum. Pip said goodbye. Then Little Mouse had to get ready for bed. Yes. Because I liked when Little Mouse and Pip got over snatching the toy and played together nicely. My favourite part was when Pip was at the door because Little Mouse was excited. Yes, I would. Because I think they would like the pictures, and maybe they would like the story. Coincidentally enough, Emily was also seven when she began her reviewing ‘career’, so it was nice to give Hayley a chance with this book (and she was *very* excited when I told her that the publisher had sent it just for her!). She’s just beginning to read independently, albeit slowly, so this was a nice book for us to go through together, even if it’s probably more suited to younger children. First, she read it to me slowly over a few evenings as reading homework, then I read it to her again, and we chatted about it before starting the review. As Hayley said, the main plot of the book (and it’s a simple descriptive story without any major plot twists) concerns preparations for the visit of Little Mouse’s friend Pip. The book starts with the hero of the piece waking his mother up and ends with him being put to bed in the evening. The whole book is dominated by Jäntti’s beautiful illustrations (it’s very much a visual work), and most young children will easily be able to see themselves in the role of Little Mouse. Mummy Mouse got the breakfast ready. The toast smelled good. “I want to pour the juice myself,” said Little Mouse. He poured the juice into a glass. “Oops!” It spilled on the table. “That’s all right,” said Mummy Mouse, and she wiped it up. Kaggsy – Yes, all my genes, I’m sure!